Did things go “funny” with your Pinterest ads near the end of June? I know they did for me. Costs went up, impressions went down, and it was generally a pretty scary time! Knowing you’re not alone is nice and all, but what’s a person to do to recover those low CPC and plentiful impressions? I’m about to share with you what I’ve been doing – and what has been working. Let’s go by the issues you might be seeing. Ever have an ad group approved and just NEVER show any impressions? I have! And this is after the campaign has gone live and reporting should be visible (24 hours after approval). This one is not anything you did. It’s a Pinterest glitch. Recreate the ad group and pause the one that never started. Don’t look for a good reason – it just happens. OK, don’t feel bad. It happens to everyone. There are lots of reasons your Pin image may not make the grade. Most often I’ve seen issues with an image that has what appears to be a clickable button or that uses the Pinterest logo. Check the list of “don’ts” and then if you still think it should be approved, email them. Fill out all the form fields to speed things up. There are actual humans in an actual room manually reviewing things. They do make mistakes. They do make judgement calls. They do admit when they are wrong – and they are surprised when people are nice about it. Fun fact: though you can’t say things like, “Buy Now!” or use any visual element that looks remotely like a clickable button, you CAN say, “Buy today.” Go figure. Fix Difficulty Level: Intermediate – try to fix it before you message Pinterest. I have seen ad groups approved, run, and then get rejected (with no email alert). So, check to make sure the individual pins are still running. It can also happen that Pinterest chokes up and makes a mistake. Happens to us all! If this is the case, pause this ad group and recreate it to see if you can get it going again. One other possibility to consider is that someone came in and outbid you by a lot. You may need to raise your bid considerably to get impressions flowing again. Sounds like a good problem to have, right? Well, not if it means you aren’t getting the impressions and clicks you want. 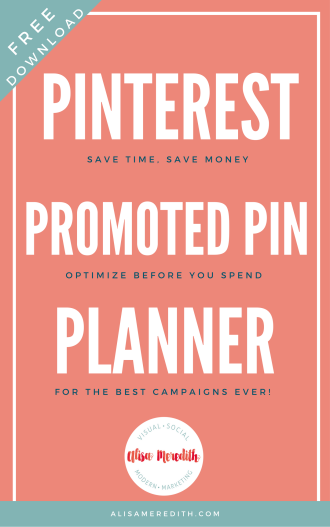 I will tell you, this is the number one issue I have had with my own Promoted Pins and those for clients. If you tell me today you want to spend $300/day on Promoted Pins, I’m going to tell you that to get there responsibly is going to take time. Probably months. So, how do you get that money well spent? If you are targeting audiences with fewer than 100K Pinners, you are not likely to get the impressions you want. Pinterest considers that a “small” audience, and I suspect they don’t do a fabulous job getting your Pin out to all those people. 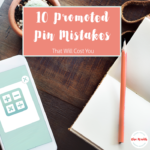 If you are targeting larger audiences, but adding on more targeting such as interests, keywords, devices, or locations, those filters are only shrinking the pool of Pinners eligible to see your Pin. If you’re not spending the money you want to, remove those extra filters. If you’re using keywords, add more!! I aim for 20-50 per ad group. 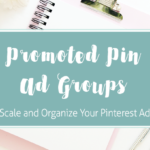 If I want to target several different sets of keywords (blog keywords, pinterest keywords, and marketing keywords for example) I will set up three separate ad groups. 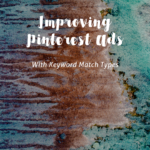 This helps your relevance score and also helps you see what is performing best (Pinterest doesn’t do a great job attributing results to a specific keyword). Fix Difficulty Level: Moderate – have a good look at your targeting and be open to new audiences. Sounds like a no brainer, right? Well, it is. You may simply be in a competitive niche and may need to pay more to get the impressions and clicks you want. Remember though – conversions come in slowly so your cost will go down over time – try to give it time before you throw in the towel. Fix Difficulty Level: Easy on the brain – hard on the wallet. If you’re running a Traffic campaign, you’re only paying for clicks. If you are getting plenty of impressions, but not enough clicks (your CTR should be at least .2%), it could be because your image is not appealing to your audience. Compare your targeting with the image. Are these people going to click? Is the messaging on the image itself likely to appeal to your audience? For instance, if your image has a text overlay of “Grow your blog traffic,” and you have two ad groups – one targeting (using keyword lists) people interested in “blogging” and targeting people interested in “Pinterest”, you can guess which ad group will do better. Could you make a new image for the second group with a text overlay of, “Grow your blog traffic with Pinterest.”? Then there’s the matter of the messaging itself. Is it clear what they’re getting when they click? Is there some subtle branding on the Pin to give them a sense of familiarity (especially important for retargeting) and added comfort to encourage them to click? Oh, and if you’re going to test more than one image in an ad group – don’t. 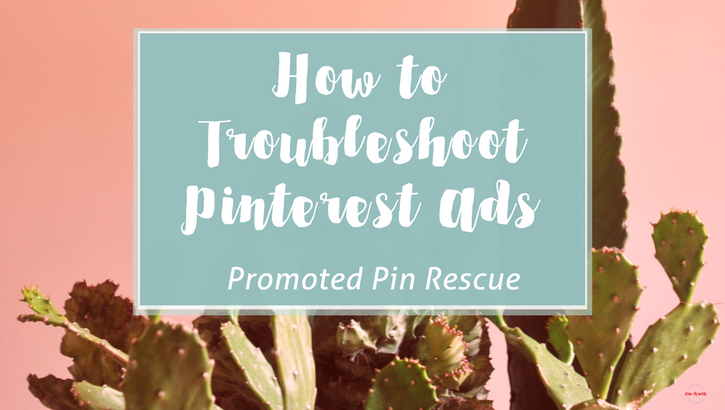 It’s a known glitch that Pinterest will often sieze on one of the images, whether it is more effective or not and give that one all the impressions at the expense of an image that could actually perform better. I’ve seen this and Pinterest confirmed it with me. Ouch. Include a subtle call to action on your image. Pinterest is choosy about these, but the worst that can happen is your Pin is rejected and you start over. Fix Difficulty Level: Moderate. I love Canva for designing images and that part is easy! Does your description tantalize and inspire – or does it give it all away? Include a call to action and a reason to click. Remember to put your most important and enticing content in the first sentence or two, as descriptions are truncated in the feed. Rather than decreasing bids and daily spend limits to the point you cannot tell if the Pin has a chance (stay above $5/day per ad group), pause some of your campaigns and reallocate funds for 2-4 weeks to a smaller number of campaigns or ad groups. Spreading your budget too thin is counterproductive – you’ll find NOTHING is working. Fix Difficulty Level: Easy as toggling that add to pause! 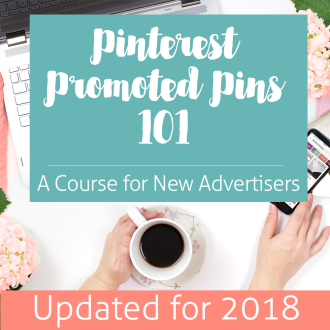 In much the same way that Facebook charges less per click for ads with a high relevancy score, Pinterest charges less for Promoted Pins that perform well – particularly for those with a high click-through rate. So again, look at your image, your descriptions and your targeting. Narrowing your targeting and keyword count could help here. 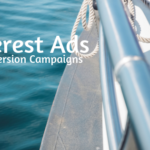 While Pinterest was recommending around 100 key words per ad group, they now suggest 25-50 as they are more interested in improving relevance than increasing impressions. If you’re using one tap, make sure you’re only using it for retargeting audiences. Strangers sent to your site from one tap are likely to bounce away quickly and eat up your budget even faster! If it makes sense to use them though, do. A one-tap Promoted Pin will have a higher click-through rate than normal, meaning you will pay less. You can only set one tap at the campaign level, so you may have to recreate your campaign to utilize this feature. Yeah, I know. You probably already thought of that. Just don’t go so low that you lose all impressions. Fix Difficulty Level: Easy – who doesn’t like spending less? If you’re not using conversion tracking to track leads, signups and sales, that should do it. If I left out YOUR problem, please let me know! If you have conversion tracking enabled, you might encounter just a couple more issues. Are people clicking your ads but not joining your email list or free trial when they land on your site? 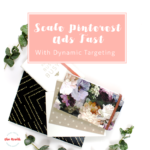 While Pinterest ads are 30% more effective at driving in-store or ecommerce sales than the next most effective channels, that means nothing to you if YOURS aren’t resulting in sales! If you are getting clicks, look at your image and description. Did you tell them what to do (and why) after they click? Are you using some subtle branding to start building trust and expectations before the click? If you’re not getting clicks, review the fixes above. 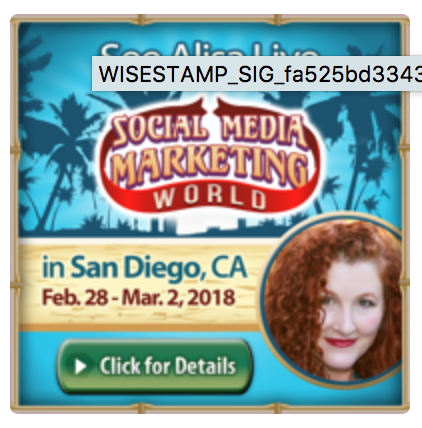 Is there some consistency of design between your Promoted Pin design and the landing page it links to? Too much of a disconnect and you lose the trust of the Pinner. In other words, even an unintentional bait and switch is going to cost you here. First try the suggestions in the section above. Now, consider the fact that conversions to sales from Pinterest ads takes time. Every time I log in to a Pinterest ads dashboard where we are tracking sales, the last 4-7 days show a horrifying display of a dropoff of monumental proportions. It’s enough to make me want to hide under my desk. 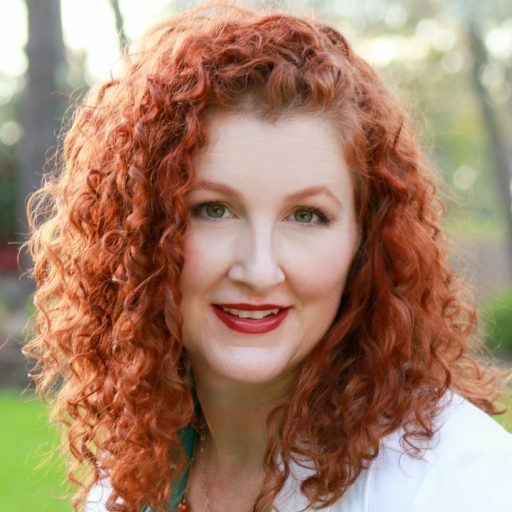 Then I talk myself down and remind myself that conversions that happen next week resulting from a click TODAY are going to show up as a conversion TODAY. Follow? So, if someone clicks my Pin today, then orders that irresistible pink cardigan in a week, that sale conversion is attributed to today. It makes sense, but it also makes for some serious Pin anxiety. This also means that it is important to let your campaigns run for a while before you give up. Give them at least a month – longer if your customers have a longer sales cycle than the average ecommerce buyer. Still think there’s a problem? If you have all your trust factors in line, look at the conversion rate from other referral sources. Is there a product that might perform better? Think about the Pinterest user. They want things pretty, and they want things easy. Think about creating a special Pinterest-specific landing or sales page for your top sellers. Also consider creating a collections page. This will allow you to use a collage image on Pinterest which can take someone to a page on your site where they can buy one or more of the items pictured. Consider using an ecommerce platform that will allow you to use and Promote buyable Pins. Or maybe people just need to warm up to you a bit before the sale. 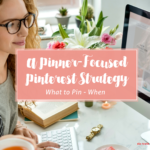 If you have enough action on your Pins, you can create a sales funnel using only Pinterest Promoted Pins. If you ARE getting leads from Promoted Pins, make sure you’re effectively marketing to them via email. 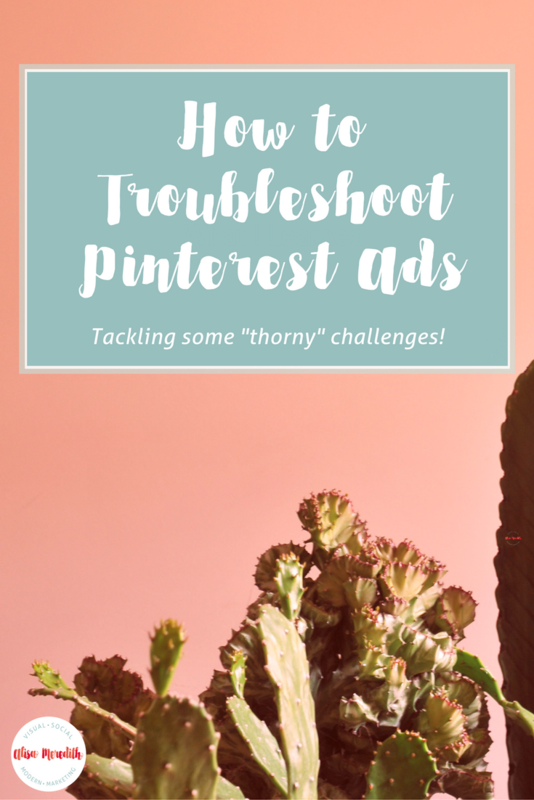 So, that’s it – the most common issues I’ve seen with Pinterest Promoted Pins. Do you have one that still has you stumped? Tell me about it in the comments and I’ll see if I can help. Was this helpful? Please Pin Me!